Namibia, a vast 830 thousand square kilometre expense of desert flanked by the icy Atlantic Ocean, is home to slightly less than 1.7 million citizens. That’s less than half the number of Cape Town residents. Unending roads stretch out as far as the eye can see under a sky that’s so big it can only be described as heavenly with space enough to truly breathe. 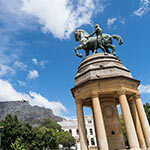 The two-week trip starts in Cape Town and winds its way up our west coast to culminate in Namibia’s capital, Windhoek. With both on and off-road riding, the 2,100 miles city to city tour is an epic tribute to solitude and uninterrupted riding with out-of-this world scenery. 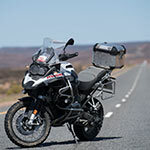 Your on-road riding experience will be punctuated by some gravel road riding exploring such places as the mountainous Cedarberg region, the Northern Cape, one of the world’s oldest deserts as well as the Fish River Canon, the world’s second largest canyon. 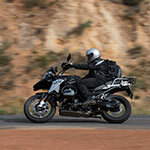 Approximately 50% of this tour is on dirt roads, some basic off-road riding skills are required. Welcome. Almost all international flights arrive in Cape Town before midday. Our tour guide will meet you at the airport and taxi you directly to your hotel where you can freshen-up and perhaps have a light bite to eat. In the afternoon we’ll deliver a tour briefing and finalise formalities. Here you’ll find out more about the route you’ll be travelling, have the chance to meet others on the tour. We’ve planned a tour of one of the world’s most beautiful cities for early evening. We’ll be pulling out all stops on your first night and be taking you out to a local restaurant certain to tantalise your taste buds. We’ll try to arrange for a local personality to accompany us for the evening to fill us in on local history, geography and answer any other questions that you might have pertaining to Cape Town. We can thereafter enjoy the Cape Town nightlife at a few of the local pubs, bars and clubs. Easing you into it. We’ll be leaving the hotel around 9am after breakfast, picking up the bikes and head in the general direction of False Bay. We’ll then ride via Fish Hoek and Simon’s Town to Cape Point. We’ll be making a quick stop at Simon’s Town to take a look at the penguins on the Boulders Beach. The Cape Peninsula National Park is but a hop-skip-and-a-jump away from the beach. 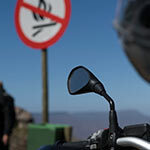 We’ll have a snack at Cape Point, also known as the Cape of Good Hope, before heading back to the city via Scarborough, Kommetjie und Noordhoek. We’ll be driving along the world famous Chapman’s Peak Drive, which has re-opened on December 20th 2003. Here you’ll be afforded breathtaking sea-views and plenty of photo opportunities. We’ll be arriving back at the hotel late afternoon. We’ll be leaving Cape Town at 10am after breakfast and heading off to picturesque Paarl. A particularly pretty town known for its world-class wines, Paarl is also the official birthplace of the Afrikaans language. From Paarl we’ll be heading off towards Wellington. Wellington is one of the large wine growing regions. From there, we’ll be making our way to Tulbagh via the breathtaking Bain’s Kloof Pass. Tulbagh is renowned for its traditional Cape Dutch style buildings. This town was completly destroyed by an earthquake in 1969. Thanks to the forward thinking of many citizens, all buildings in Church Street were restored to their original glory. We’ll be spending the night in a guesthouse. The Southern-most mountains of the Cederberg range are about 100 miles from Cape Town. After a hearty breakfast we’ll be making our way through these winding roads to Ceres. Our first gravel road stretch takes us towards Citrusdal from Op die Berg. of the Cederberg wilderness area. 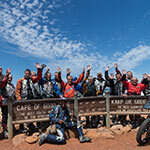 After lunch we ride over the Botterkloof Pass and finally on to Nieuwoudtville, where we’ll be spending the evening. Nieuwoudtville is the portal to Namaqualand. In the Spring time it boasts a wide range of flowers that decorate this side of the escarpment. 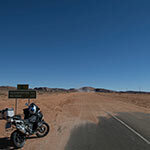 Our journey, on this day, takes us through the Namaqualand, in a northerly direction towards Springbok. 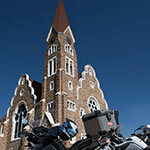 ‘koppies’ the outstretched savannah lands is the home of sheep and goat-farmers. wild spring flowers and burst into a kaleidoscope of colour. along the Specktakel Pass. We should arrive just in time for a late lunch and a dip in the pool to cool down. 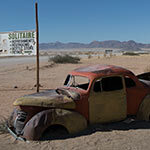 Springbok is the largest town in the Namaqualand area. Koubis massif all the way down to Ai-Ais. I can tell you from experience that eating breakfast after watching an African sunrise tastes particularly good. We’re certain that you’ll think so too after watching the sunrise over the Fish River Canyon. 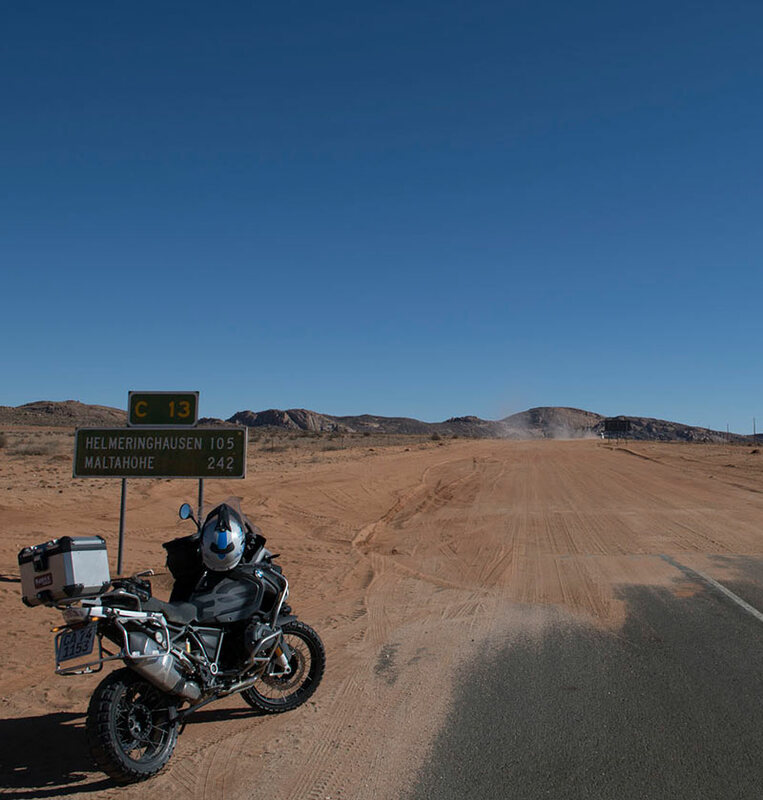 We’ll travel from here to the Orange River and follow it through the Richtersveld national Park. Soon thereafter, we’ll change to follow a northerly direction to reach Rosh-Pinnah, the centre of the once powerful Namibian zinc and mineral mining industry. We’ll reach Aus early evening where we’ll recharge our batteries overnight with the help of a bottle or two of the famous Namibian beer, Tafel Lager. We’ll travel along the West Coast to take a look at the seaside town of Luderitz. The picturesque village is named after the German tobacco handler, Adolf Luderitz. Today, the village survives off Guano islands and the export of the ample langoustines. The delicious crustaceans thrive in the 9 to 20 meters deep offshore reefs. Ever conservationists, all langoustines are only caught and traded when they exceed 65 mm in length. 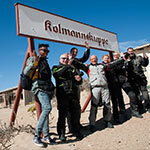 Early afternoon will see us exploring the eerie ghost town of Kohlmanskop. Diamond fever resulted in the town being erected as quickly as it was deserted. Towards late afternoon, we’ll head back to Aus to enjoy a sunset drive in the nearby Wild Horse Park to enjoy an incredible sunset Namibian style, with sundowner in hand! Today we’ll continue on our journey in a northerly direction on the Namib Desert’s western side, flanked by central plateau on our right. Completely uninterrupted by western civilization, this amazing landscape’s horizon seems endless. We’ll also take a deserving detour to visit a rather bizarre but fascinating fairy tale castle called the Duwisib Castle in the middle of an apparent nowhere. 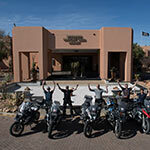 We’ll arrive at the Sossusvlei Lodge early afternoon to wash the Namib Desert from our bodies as we relax in style. Refreshed, rejuvenated and revitalized, we’ve planned an early start to explore the dunes that are particularly breathtaking at dawn’s first light. 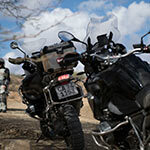 We’ll trade our motorcycles in for 4×4’s on an adventurous game drive through Sossusvlei’s game park where we’ll enjoy breakfast. 45km from the Park’s entrance gate, we’ll take a gentle walk on the spine of the aptly named Dune 45. The more adventurous are welcome to re-discover their inner-child by making their way down the cliff like dune’s flanks in giant bounding steps. Lunch will be served back at the lodge where you’re welcomed to take some timeout. However, the more energetic guests are welcome to book a scenic flight over the dunes. The helpful staff at reception will have all the booking information and will gladly make recommendations. We’ll spend our second night at the Lodge. We’ll stay faithful to the gravel roads that have treated us so well thus far as we make our way to Swakopmund.Known as the Riviera of Namibia this seaside town is more German than Germany with quaint German architecture and delicacies. Complete with Brauhaus, this little Germany by the sea is quaint, fun and best of all, relaxing. We’ll spend the night here in a luxury hotel, a tasteful conversion of the town’s historic main train station. We all need a day of rest at some point. 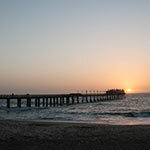 That’s what we’ve got planned today – time to explore Swakopmund and perhaps enjoy a cold beer or two at the beach. The more energetic are welcome to explore the surrounding countryside such as the nearby Skeleton Coast and the small fishing village of Henties Bay, a highly recommended lunch spot for lovers of seafood. There’s quite a bit to do at Swakop such as duning on quad bikes or perhaps a camel? This will be our last day of travel. 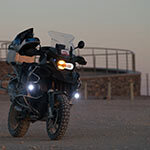 We’ll arrive in Namibia’s capital around lunchtime but not before we’ve taken a final spin on a Pad, the affectionate local term for gravel road. Our last dinner will be a memorable one at a local jaunt certain to make a culinary impression. We stay at the Windhoek Country Cub. Most of our guests’ flights will depart late afternoon which leaves us with enough time to take a gander through Windhoek and make one or two final purchases.